The humble spud gives us so many wonderful foods – chips, wedges, gems, hash browns, mash, loaded spuds, crisps... even vodka if, for some reason, that's your thing. And now it's given us the Hoppy Potato Ale. It's the official beer of Brewsvegas 2018, Brisbane’s weeklong, citywide celebration of good beer. 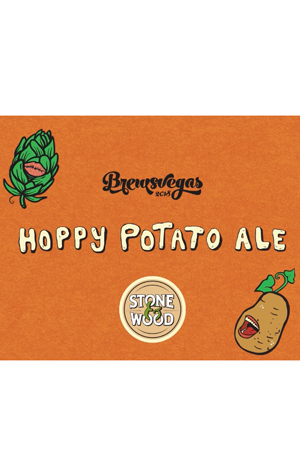 Stone & Wood teamed up with Brewsvegas and food rescue organisation OzHarvest, which collects surplus food from businesses around the country and delivers nutritious meals to charities and people in need. But, rather than working with a more obvious ingredient (we have enough citrus IPAs, right? ), they went with sweet potatoes and good ol’ regular potatoes. So what happens when potatoes that were destined for landfill (don’t worry, there was nothing wrong with them) are saved, shaved and added to a pale ale brew? Well, if you're after a beer that tastes like potato, keep on looking. Despite containing 60kg of earth apples, this slightly cloudy beer doesn't taste like a serve of crunchy fries (no matter how much you want it to). The addition of the potato adds starch, which increases head retention (potato head? ), and gives the beer a smooth, creamy body. When it comes to aroma and flavour, expect hits of tropical and grapefruit notes, with the Galaxy, Enigma and Fortnight hops doing all the heavy lifting. Good thing they carbo-loaded. With all profits going to Brewsvegas 2019 and OzHarvest, this beer is bearing the reputation of the World’s Greatest Vegetable with great honour. Oh, and guess what part of the brewing process the potatoes were added in? NB: If you're checking this out pre-Brewsvegas 2018, you can find everything Pint of Origin related here too. And there's a big Stone & Wood fundraising event at the end of the week too.